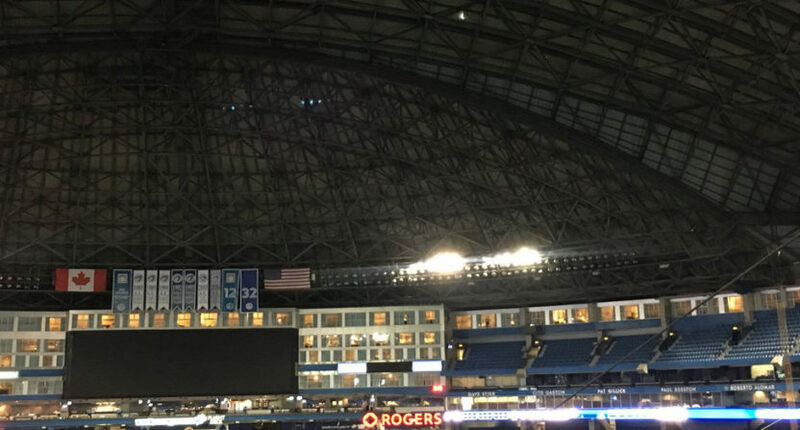 The Jays' "our game will be played as expected" tweet bragging about their roof wound up going wrong thanks to falling ice punching a hole in that roof. Things aren’t going so well for the Toronto Blue Jays’ Twitter account. There’s been an incredible wave of postponements thanks to weather across Major League Baseball this year, with 22 through Sunday (the second-most MLB has had through April since 2000, with the month only half-over), and so the San Diego Padres decided to show off their good weather Sunday and declare that their game would be on. The Jays’ account then tried to follow suit Monday thanks to the Rogers Centre’s roof, but then had to delete that tweet after their own game came into question thanks to falling snow and ice from that roof and from the neighbo(u)ring CN Tower. And that roof will have to be repaired, and workers need safe access to it. Last time a game was cancelled was April 12, 2001, when panels collided when the roof was opening. But this goes to show that even a roof isn’t always proof against the weather (as the Jays’ fellow Toronto sports team could tell them; the Raptors’ playoff game Saturday was delayed thanks to a leaking roof at the nearby Air Canada Centre). And that tweeting about how great your conditions are can be a recipe for some future problems. Sure enough, the game was canceled later in the afternoon.